Tiling shower wall coverings doesn’t have to be hard. But the right methods make a huge difference. Our last tutorial shared tips on how to tile a pebble stone shower floor. Tiling the floor first helps wall tile hide expansion and contraction joints. We’re super excited to share our video. When using large format tile, like 12×24 porcelain, it’s important to determine layout. The shower in today’s video has a corner shower bench and niche. These along with the shower width and height factor into the tile layout. First, get a measurement from the shower floor to the ceiling. If a tile is less than 2″ at the ceiling factor that into the design to eliminate it. Second, get a measurement from wall to wall. Again, if there’s a sliver of tile on either wall or niche or bench, reconfigure the tile layout. 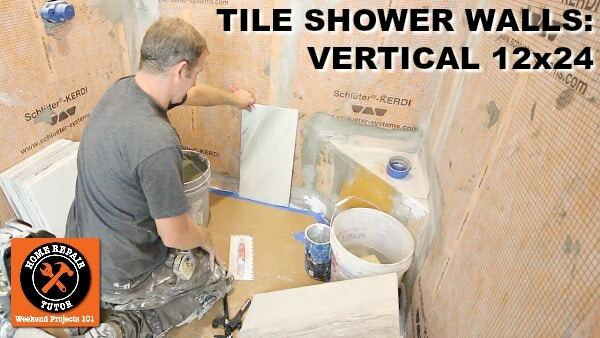 Today’s video does a great job explaining how to layout vertical 12×24 porcelain tile and why it’s important to stagger or offset large tile. What guidelines should we all use when tiling shower wall or floor surfaces? Simple, visit the TCNA website and buy their Handbook. It’s the Bible for tile installers. And should be part of your planning process. Do we always follow TCNA guidelines? For the most part yes but sometimes no; for example, sometimes it’s nice to have a 1/16″ joint between shower floor tile and wall tile. All shower walls should be 100% waterproof before setting tile. 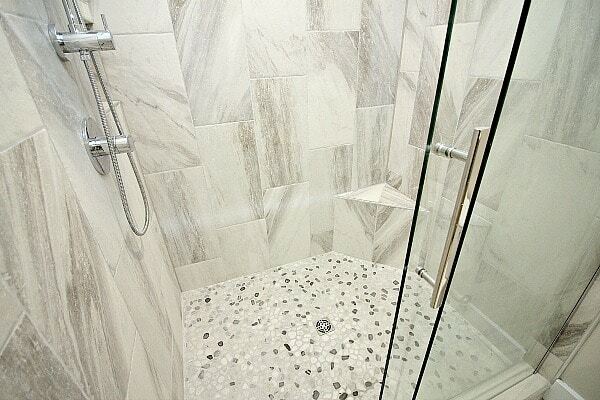 Schluter’s KERDI Shower Kit was used for this walk-in shower. Also, Schluter’s ALL-SET mortar is a good choose when using Schluter products. It maintains the shower system warranty. That said, if you prefer other mortars just be sure they’ll warranty their product over KERDI. Are you building a shower like the one in our video? We show how to build showers (Schluter, Wedi, Curbless, etc. ), install tile, upgrade basement bathrooms, and more. Thanks Adeola, and yes, we work with ceramic. You may not need the wet saw for cutting ceramic. But it does help. A good manual tile cutter and angle grinder with diamond blade might suffice. Thank you, we use ceramic and porcelain tile. Wet saws aren’t always needed, just depends on your tile. Good tile cutters like the Montolit Masterpiuma and an angle grinder with diamond blade might suffice. The Masterpiuma comes in different sizes for different size tile, and will last a long time. It’s way better than any manual tile cutter at home stores. Thank you for the 12×24 shower wall video. It looks fantastic! It also looks like I have chosen the exact same porcelain tile for my project as well, however, I am not using the kurdy system but hardy backer board. Two questions please…. 1. Which thin set would you recommend? consistent with the bathroom floor pattern using the exact same tile. Stacking vertically 1/3 may clash with the floor pattern laid 1/2. After watching the video I’m a bit hesitant to begin. Than you again for all of your insight and guidance. Hi Rex, thanks for your question. We recommend Ardex X77 for large format tile like 12×24. It’s polymer modified and will prevent tile from sliding down the wall. We stacked them vertically because of personal preference, you can position them horizontally. The 50/50 split is okay, but you’ll have to keep an eye on lippage between adjacent tile, meaning the tiles might not sit flat to each other. Using a 1/3 staggered or offset pattern helps reduce lippage. I’ll send you an email and follow up. After you cut out the holes for the shower faucet and spicket on the backer board, do I need to fill in the gap with mortar if I over cut the hole by an inch (in certain areas? Or is it ok to leave the hole since it will be covered by thinset and waterproofed? how far off the tub should the tiles be placed? I remember hearing about a rule of thumb to start in the middle of the main wall. From the tub, start with the first tile half of a tile up (minus one inch). In other words, take a tile and subtract 1 inch. In this case my tile will be 22 inches long. then start 11 inches (half of the shortened tile)from your tub. This is where the first full tile should be placed. Does that sound right?